I'd like to ask you to forward this link by e-mail , Facebook and Twitter to as many people as possible , it really doesn't matter if they are 'into wildlife' or not , I'd like everyone to learn about this issue . Or if you have your own website then please copy the details onto it and encourage as many visits as you can. 'Malta – Massacre on Migration' will be my first 'as live' nightly YouTube diary from the frontline of this Mediterranean slaughter ground . Each evening at 9.00 PM UK time we will upload a short report of the days activities to increase awareness of the impact of the mass killing of birds and to ask viewers to help us end this vile travesty . So please click on the link for more information and then please share it widely . We can make a difference - but only if we act . The Sandown Bay Academy connection. 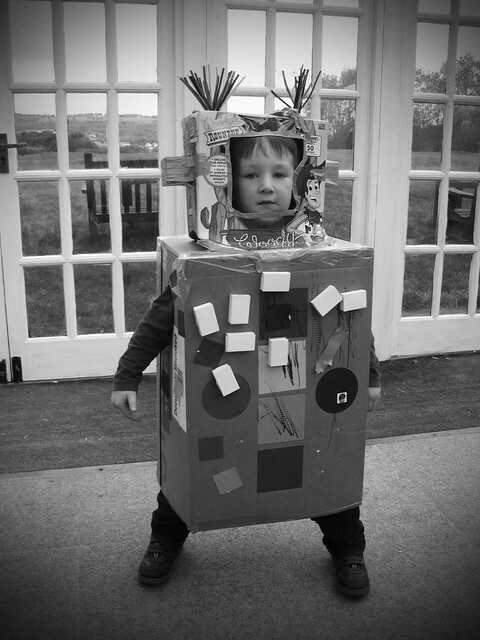 It's been 11 years since our first tentative steps into the world of creative education. 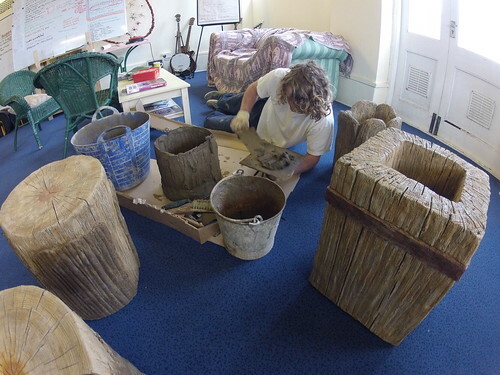 In 2003 our Nige was commissioned by the Island 2000 Trust to work with three schools on the Isle of Wight as part of a project called Landscape Reflections. 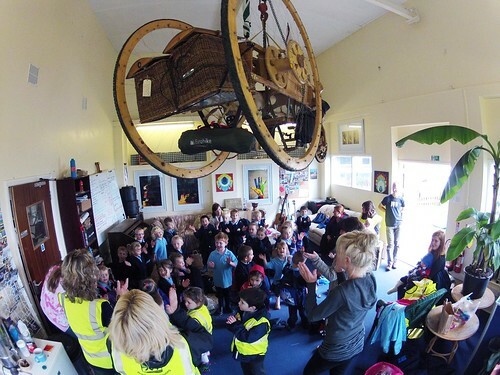 After that project, with myriad of commissions coming from visitor attractions across the UK, it was to be another three years before we delivered our next project in a school. Since 2006 though we've worked with over fifty schools across the south of the UK and over that time we've worked with thousands of students from preschool right through to third year University. 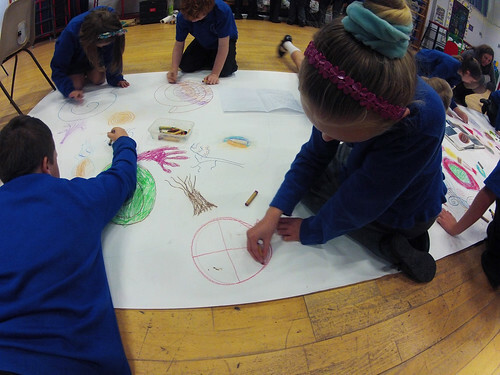 Our introduction to creative education all those years ago had a profound impact on us, it changed our working practice and the direction in which we wanted to go....in short it changed our lives. So it seems fairly remarkable that in all time we've never worked with our own local secondary school, either in its current form as Sandown Bay Academy or in it's previous life as Sandown High School even though it's walking distance from our studio! A few months ago we made the decision to put that right and we're pleased to say that we're currently working with Sandown Bay Academy on not one but two projects. 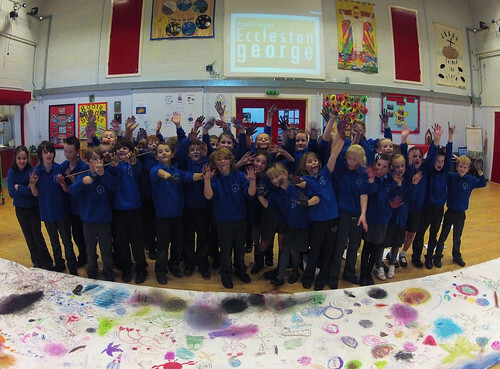 Both projects have Eccleston George team members working with sixth form groups from the school. The first project is an interior design community art project working with the school's 'Event Management' students and the second project sees us working with the six form 'Animal Management' student group. Above: Lily from 'Event Management' six form group with the crew tee shirt students designed and made. Our own Darren Brazer and Cam Snudden are working with the Event Management group on, what is for us, a brand new kind of school project. Cam and Darren are using their amazing computerised vinyl cutting machine to help the students to decorate one of the school's reception areas. The sixth form students have followed our advice and delivered a series of 'in school' community consultation events in order to gather ideas from students of all ages from across the school. Ideas and designs collected from the school community have then been shortlisted by the sixth formers and now the winning designs will be made into giant vinyl decals that will adorn the walls in the school. To get the project rolling, our two man team worked with the student group to design and make 'crew T shirts' for the project. Each student worked with Cam and Darren to work up T shirt designs on special computer software. Then they took the students through a process that not only showed how to use the computerised vinyl cutting machine but also how the machinery all works. 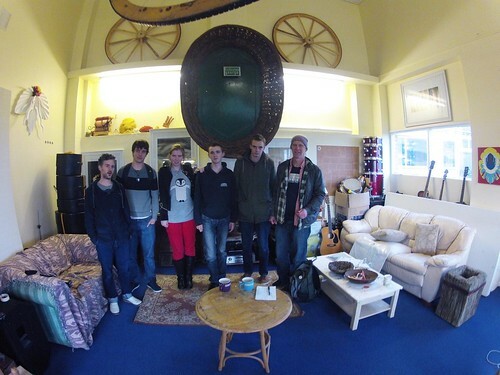 Our boys will be working with Sandown Bay Academy over the next six weeks or so. 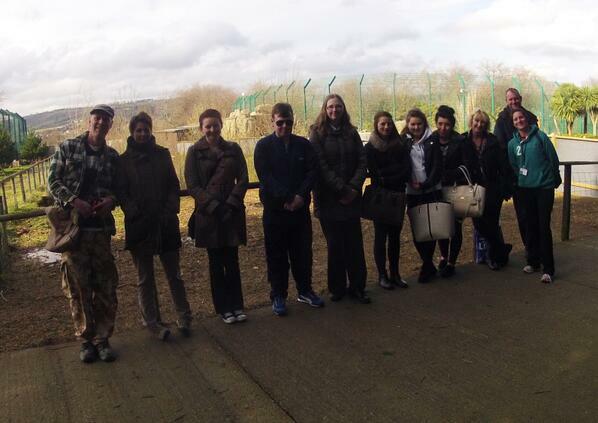 Above: Students from the sixth form 'Animal Management' group on a site visit at the Isle of Wight Zoo. 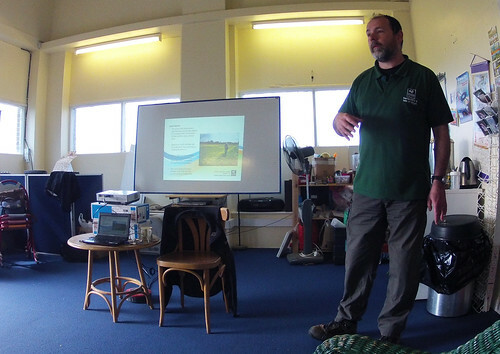 The second of our projects with Sandown Bay Academy takes the form of another 'real life' project, this time working in partnership with the Isle of Wight Zoo. 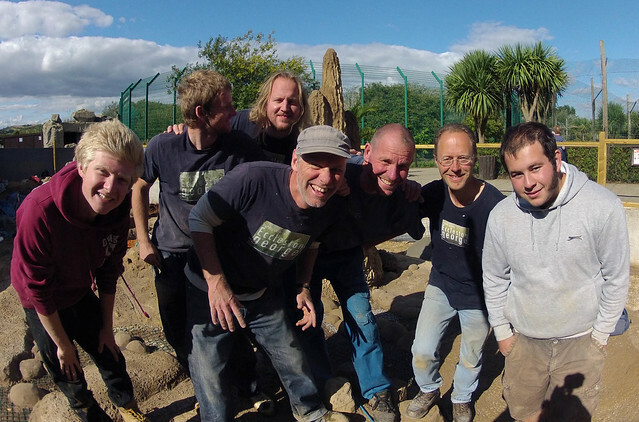 The schools Animal Management six formers have joined us to help design and build the zoo's 'New for 2014' exhibit. 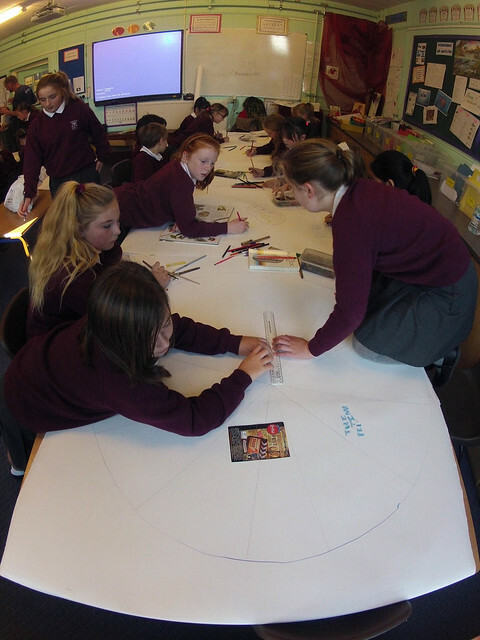 The students are in the process of designing a complex and innovative 'walk through' enclosure that will give visitors the chance to meet the zoo's population of Meerkats. 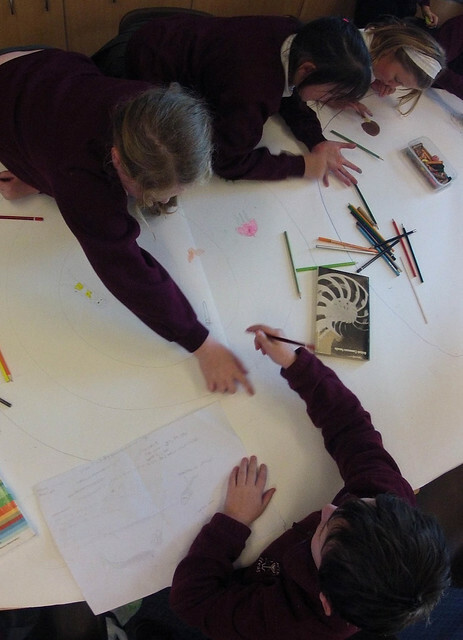 Our own team is working closely with the students to guide them through the entire creative process of imagining, researching, designing and building the new zoo exhibit. 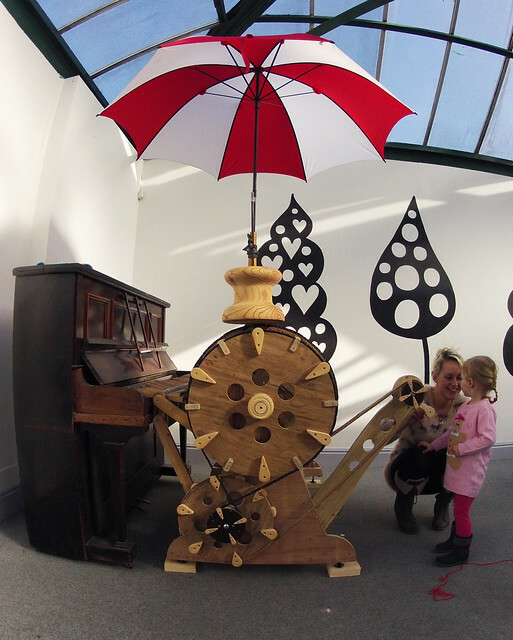 Once completed it's thought the project will be a European first both in terms of the novel nature of the exhibit and the way it will have been developed in collaboration with a local school. So it's our hope now that we're starting to make up for the lack of attention we've paid to our local secondary school and that through these projects we'll all be able to show how important it can be for schools to work with creative practitioners and local businesses. These two projects are funded quite differently - Cam and Darren's interior design project is funded directly by the academy itself. After students worked out business plans and budgets they pitched the idea to the head teacher and school governors and the project was given the green light. The zoo project is an entirely different kind of project that costs the school nothing at all. To find out more click here! Cheerio old chum, it's time to set you free! Ten years ago a new boy joined our Eccleston George team, his name was, and still is, Spike Oatley . The truth is that until Spike came along Eccleston George wasn't so much a team as it was a duo consisting of Nigel George and Chris Eccleston. Spike's arrival brought the dawn of a new era for us as the duo became a 'team' for the first time....... Eccleston George, it turned out, would never be the same again. This shift from being just two blokes working together to becoming an adaptive collective has stayed with us until this day. 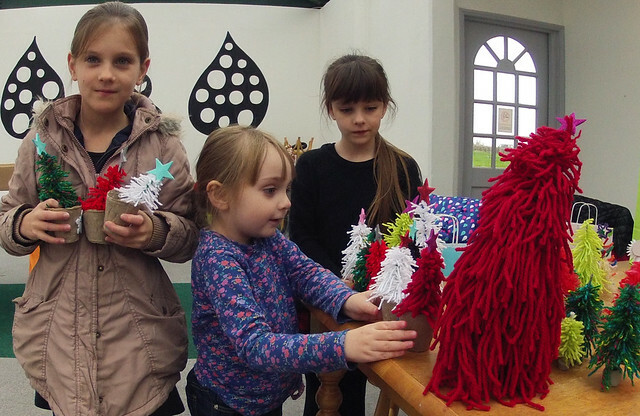 Many more members have joined our band of merry creative practitioners and the group dynamic and the projects we deliver have continued to grow and morph as a result. This week will see yet another example of us embracing change as after ten years of service to the Eccleston George collective we say cheerio to member number three, Spike Oatley. Spike and his beautiful family are about to set sail from our Island shores and head out westward on a brand new adventure. Us lot wish Spike, Catherine, Ernie and Ellie the very best for their new life ahead. Nige has this message for Spike. "Over the last ten years, hour for hour, I think I've spent more time with you than anyone else I know (including my own family). Despite being in some very tight work situations, countless tiny enclosures meant for very small animals, up ladders, on scaffold, dangling from ropes, in boiling hot places, in freezing cold places and in more school classrooms than most will see in their lifetime....plus.... in spite of being squeezed into an array of site caravans, chalets, hotel rooms and other miscellaneous digs on location, I know that we've never had a cross word in all that time....I reckon that's an amazing rare thing and rather splendid too. Seeing you transform over the years has been incredibly inspiring, a brilliant lesson in how to find, and live in, your element. Standing back and watching your musical talent emerge over those ten years has been utterly mesmerising and has been a great reminder of how important it is to keep the fire in one's soul ignited. So now as you head off to Ireland I console myself that this isn't the end of our friendship but a whole new chapter in a continuing story of what's possible for all of us. Our loss is Ireland's gain, no doubt about it....and anyway I've a sneaky feeling that it's only a matter of time before us Eccleston Georgers pick up our first ever project in an Irish school or something. In the meantime good luck with finding those new pastures of emerald green mate and thanks, it been a blast." 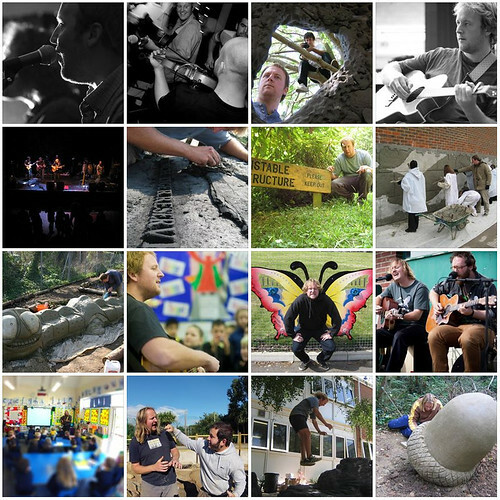 As part of its current outreach projet, Arts Council of England are working with our friends at Quay Arts and ourselves to find ways to support and encourage creativity and talent on the Isle of Wight. 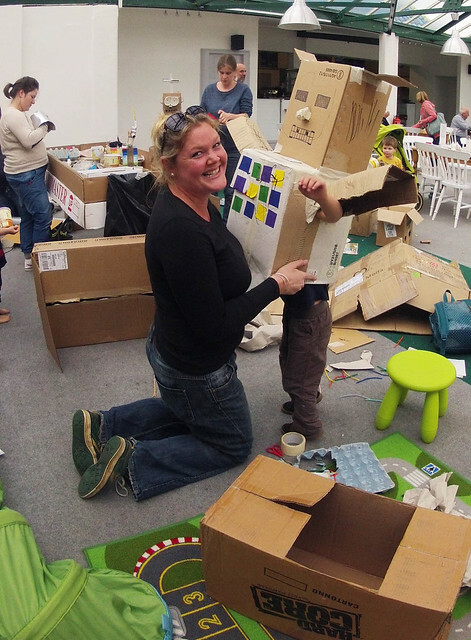 · explore a ‘co-creation’ model to contribute to a diverse programme at Quay Arts. · work with and learn from others by putting practitioners and professionals together. 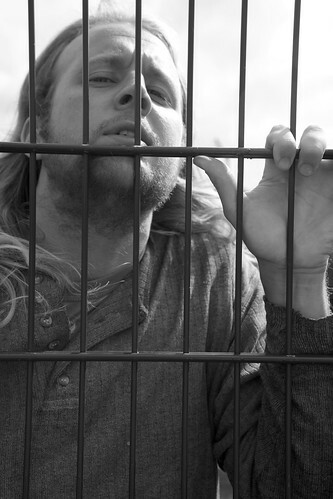 · support creative talent by giving opportunities to produce new work. 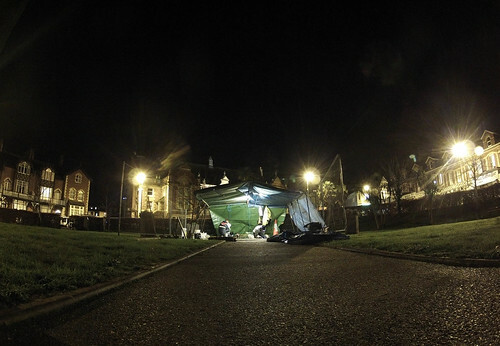 · make better use of and expand Quay Arts’ sites and facilities. 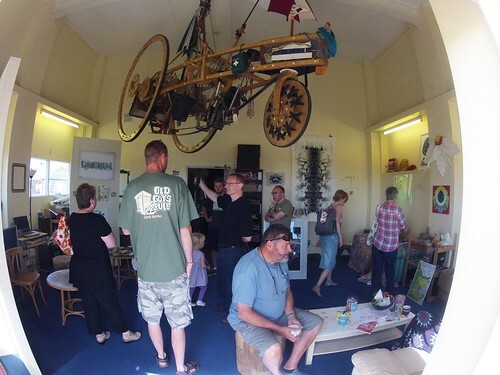 So we've got together with Quay Arts to create an arty outpost nextdoor to our own studio in Sandown Bay. 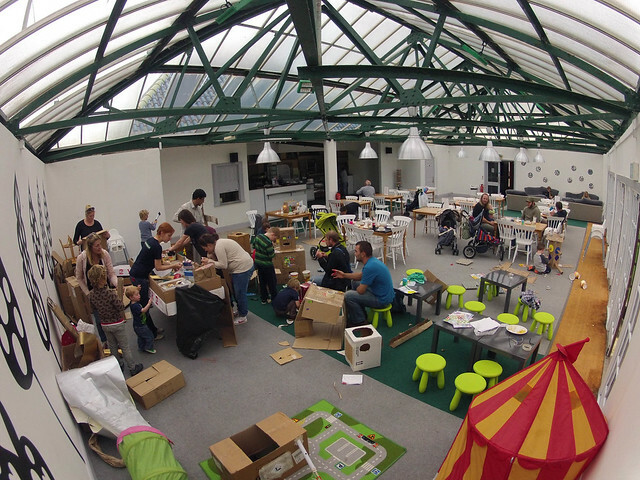 Browns Cafe is currently operated by the Isle of Wight Zoo (our nextdoor neighbours on the other side) and together the three of us are building a programme of community art & craft workshops and other cultural events in the cafe space. 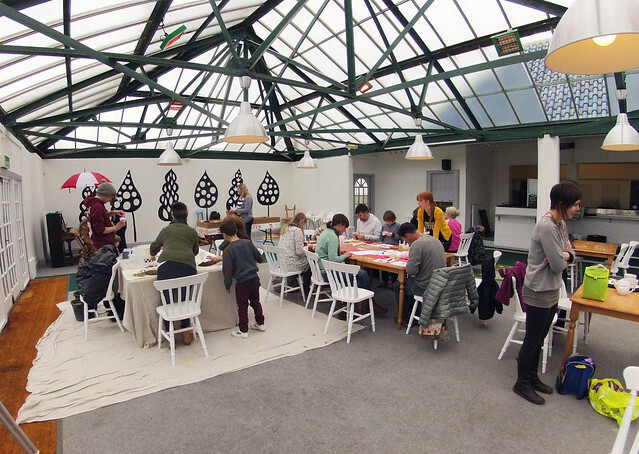 Browns Cafe is a brilliant 1930's building and is proving to be a superb spot for events and workshops. 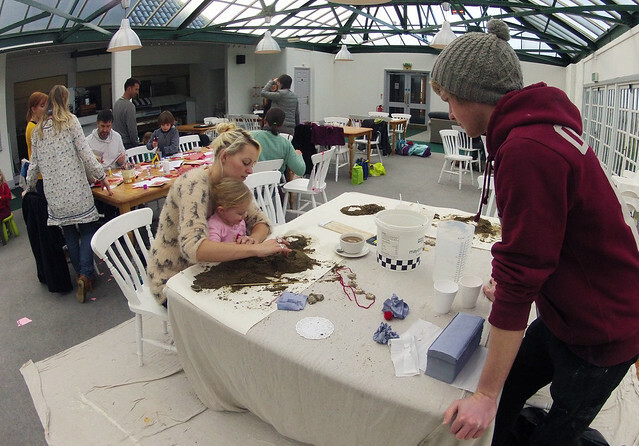 Our own Hannah George who's been organising and running the family craft workshops there said "It's amazing how many people have never been to Brown's Cafe before, and when they see the place for the first time they love it". 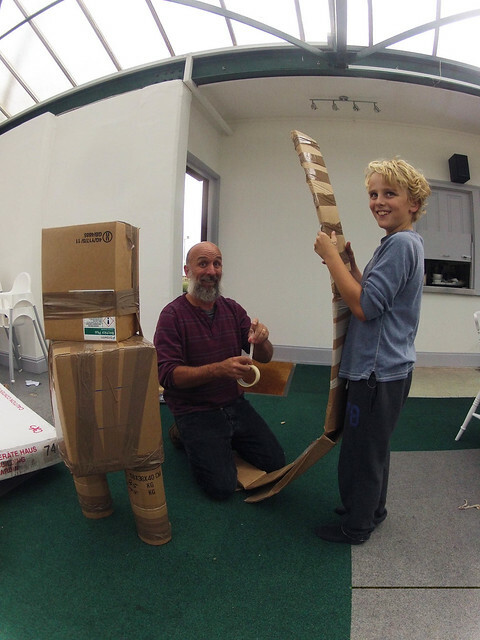 We're now hoping that these early events will be the first of many similar workshops and happenings to take place at Brown's Cafe and that by working closely with the brilliant Quay Arts we'll be able to showcase their fantastic work to a new audience on the south east coast of the Island. "So far we've delivered three family drop-in craft workshops at Browns" said our Nige "There's also a regular spoken word event called Chorderize taking place their too which is just brilliant. Our next family drop-in craft workshop will be on the 15th March and will be inspired by the animals from the Isle of Wight Zoo." We think AA stands for Artful Angels. On our way from our Isle of Wight base to our latest community art project in Devonshire two weeks ago our van had a little mishap and broke down on a roundabout (on a yellow box) in Christchurch dorset. It transpired that a connector on our hydraulic clutch assembly had snapped in half leaving us very stuck in a very akward place. 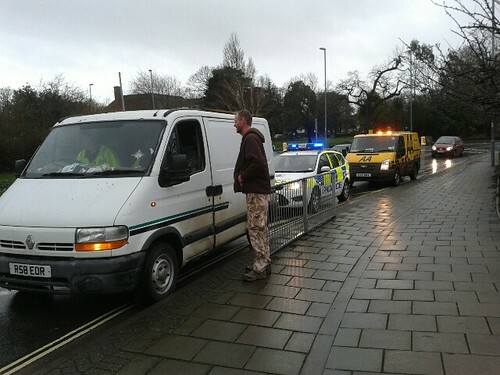 We managed to shove our stricken van to one side so traffic could pass and phoned the AA. No sooner had we made the call did Mark the AA man appear out of nowhere, a bit like the shop keeper in the 70's children's tv show Mr Benn. "What's the problem chaps?" he enquired in cheerie kind of way, "the clutch is broken" we replied glumly..."lets take a look" said Mark the AA man.....so he did. What happened then over the next hour or so was nothing short of pure automotive fixing art and craft. 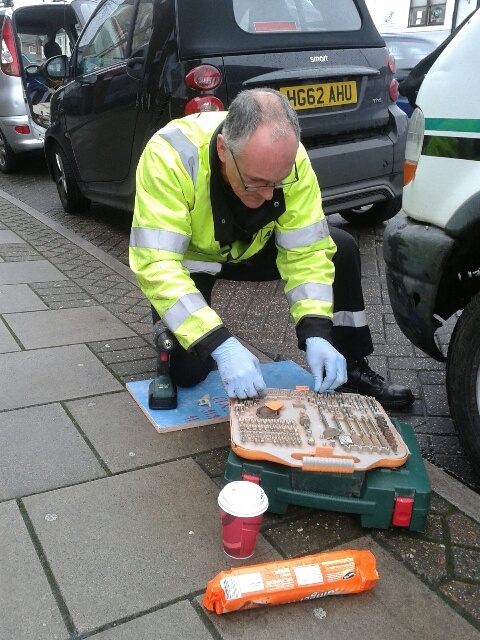 Using bits and bobs from the back of his van, all of which were meant for things other than what Mark the AA man was using them for and some of our own tools that we had with us, he crafted a roadside fix of utter genius. It was wonderful to see a man in his element using his aqcuired knowledge and skill to innovate a beautifully crafted solution to our problem. Anyone that know's us will know we're very used to reinventing, reusing, recycling and upcyling stuff to make things much better than their parts, so for us lot watching Mark work seemed quite familiar in many ways...not least because one of the materials he used to fix our broken clutch and get us back on the road was a clay-like substance Mark the AA man called resin steel, or something like that. Now then, all that would be brilliant enough but after he left us we discovered that Mark the AA Artful Angel had left us a strange calling card made from the resin steel stuff he used as part of his innovative roadside fix ...see below. 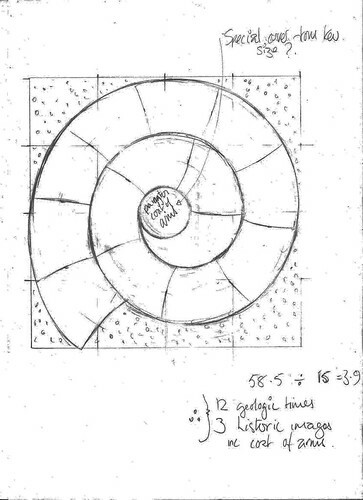 What's so odd about that I here you say.....well just take a look at the floor plan (below) of the design layout for the project we were on our way to do when we broke down. 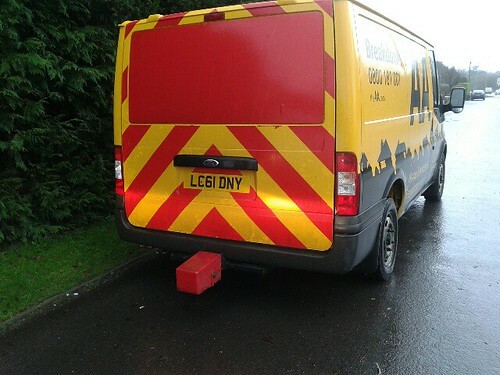 We think that Mark the AA man is probably psychic as well as crafty! 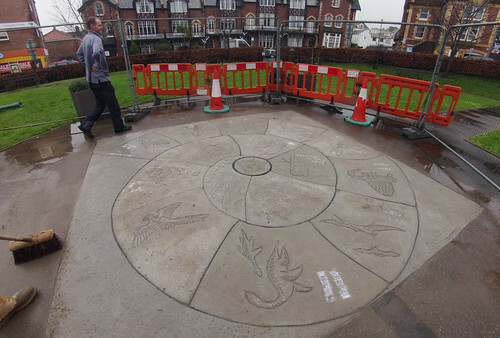 See our blog story about the Paignton time spiral here. 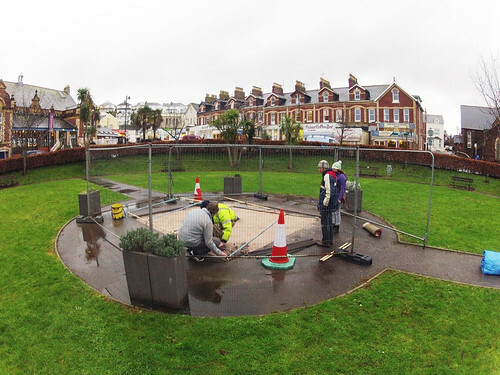 Our First project of 2014 has seen us produce a decorative floor in a small park in the Devonshire seaside town of Paignton. 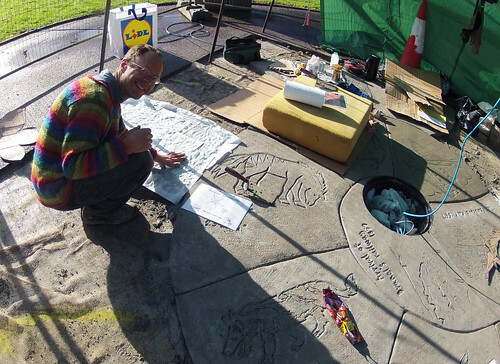 This latest work is part of an on-going project that we're working on with the local town community partnership to produce a walking trail between the Paignton seafront and Palace Avenue Gardens which can be found at the top of the town. 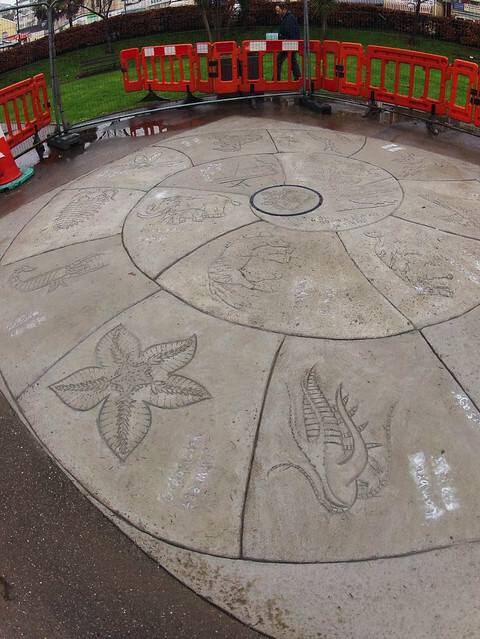 We worked with two fantastic local primary schools in Paignton to come up with the design for the sculptural floor which is based on prehistoric and historic time zones. 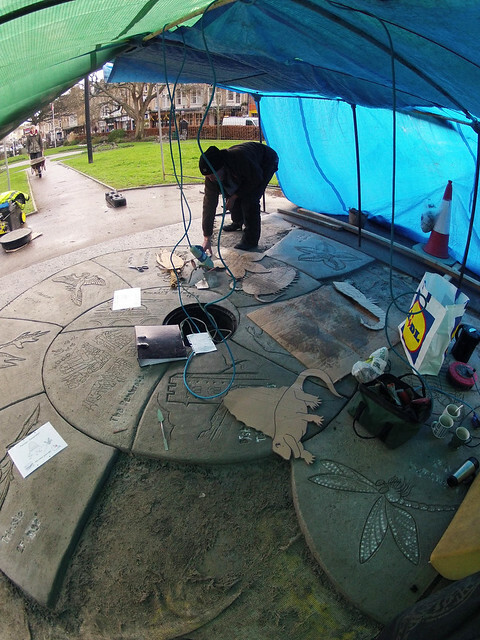 Now that the 'time spiral' decorative floor is complete we'll now concentrate on making the way-markers that will lead people along the proposed route. 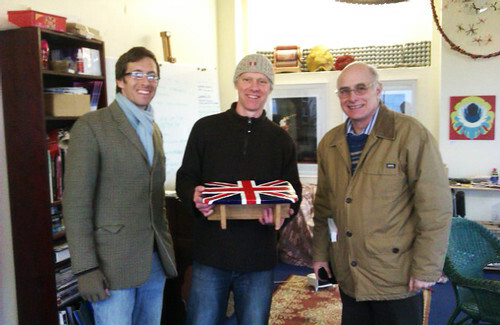 Watch this space for more stuff happening down Devonshire way! 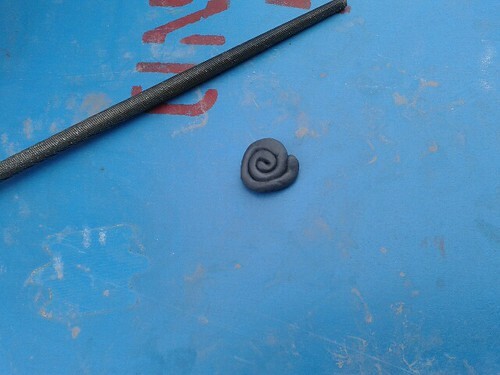 Photos below show the design and making phases. 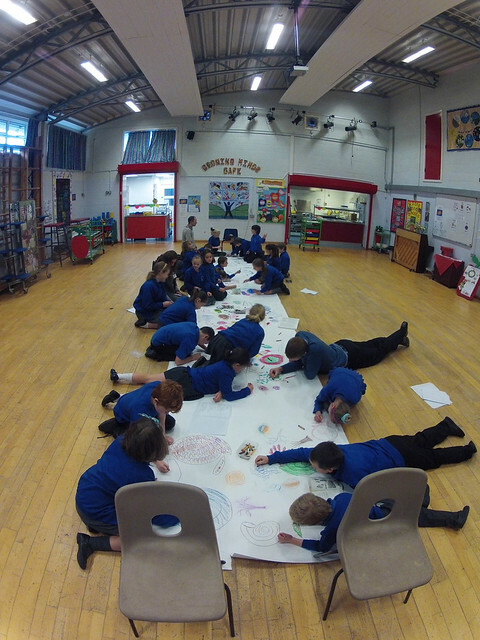 Design workshops at Collaton St Mary Primary School. The true spirit of Christmas has arrived....finally! Nige here! Happy Christmas everyone. Blimey it's that time of year again, don't panic and try to relax a bit if you possibly can! It's never easy over the Christmas and New Year holiday what with all the stuff to do and all the stuff to buy. It seems to me that the month of December has become an annual display of our frenzied consumer driven existence, a yearly stumble into a monstrous vision of what our plastic coated lives have become..... and I've got to say I don't like that bit of it much! But Christmas is about family and friends too, it's about goodwill and festive cheer I hear you say and that's true of course but remind yourself of that on Boxing Day when, merry on sherry, Aunty Dot asks your children what Santa got them for Christmas?... and they reply with a "errr" and then struggle to recall the contents of the gift mountain that so excited them just hours earlier. But you can forgive their memory lapse because you know the kids can't be bothered to think about what happened yesterday when there's so much fun stuff going on now, Granddad's found his old guitar and is now murdering a version of Silent Night while a tipsy Uncle Colin's trying to keep rhythm with a empty wine bottle and a teaspoon.....brilliant! When eventually this Christmas holiday is all over what will you and your children remember most about it do you think? I think Christmas nicely crystalises some aspects of modern life that we could do with much more of, as well as quite a bit we could very well do without. It's not really what we want...is it? Try this at home if you've got older teenagers about, or at school if you're a teacher of older kids.....ask a teenager what they want to do when they leave school, when they tell you their answer then ask them why they want that particular job, when they give you that answer ask them when where they happiest in the last month? Their answers are usually an amazing insight into the mismatched values we've placed upon ourselves as civilized beings. By the way, ask a young child what they want to be when they grow up and the answers are entirely different....and totally brilliant! What you might be able to glean from this teenage question and answer game is that what we really want most is to be around other people having fun with them, after all, those are the things that we remember most when we look back across our lives it seems to me. The desire to surround ourselves with people we care about is hardwired into our DNA, buying stuff to make us happy on the other hand is something that we've learned to 'love' quite recently. Taught to us by post war government economists looking for a way to boost our nations flagging finances, consumerism was seen as the only way out of the terrible austerity thrust upon us at that time. Make stuff, sell stuff, make more stuff, sell more stuff and then when we get board of having so much stuff advertise yet more stuff....tell consumers their lives will be much better if only they had more stuff. That was the ideology of the economists....and so that's how it was/is. You might say, well what's wrong with that, it worked didn't it? Consumerism dragged us out of post war austerity and within a generation gave us all lifestyles we couldn't have imagined 50 years ago. The problem is that it has come at a terrible price, perhaps the biggest cost being that it hasn't made us very happy. In the western world rates of depression are higher than they've ever been and people are, despite the advent of social networking technology, more isolated and lonely than ever before. Then there's the terrible environmental cost of our bloated consumerist ways, 'stuff' it turns out doesn't just come out of thin air, it's manufactured from bits of our home....it comes out of the very planet we walk on. Our hunger for more stuff means that every day on a ever increasing scale we dig, drill, mine, explode etc our way into our planetary home in order to get to the raw materials that we need to make the stuff that we think we want and is currently is littering our homes. Every single day we plunder the very earth beneath our feet so that we can satisfy our desire for stuff that other people tell us we need in order to make our lives better......sad isn't it? how ever did we fall for it? The Wind of change is a blowing. Don't worry, I haven't forgotten it's Christmas! This year we at EG reckon Christmas comes with a brilliant realistic message of hope, just watch this space because fantastic stuff that will benefit us all is on it's way. And also don't worry because it still involves 'stuff' no one's going to take your stuff away from you, in fact quite the opposite is true. People you know and some you don't are going to be queuing up to give you stuff and you'll be beating down their doors to give them stuff too. Our culture of consumerism is changing, a new economic ideology is cruising the globe and us lot at Eccleston George have placed ourselves right at the pointy end of it. Like Kate Winslet (or was it Leonardo DiCaprio?) in the movie Titanic we're we're leaning over that 'pointy end' hands free shouting out loud "I'm on top of the world" and we predict that unlike the Titanic this is one idea that ain't going to sink without trace. 'Collaborative Consumption' it seems is here to stay and I can think of no better time to talk about it than at Christmas time because it embodies the very thing that everyone talks about as being the spirit of Christmas - sharing, caring and trust.......just imagine, right now across the globe economies are being re-imagined on principles founded on those very things. So, perhaps the true spirit of Christmas is finally prevailing after all. 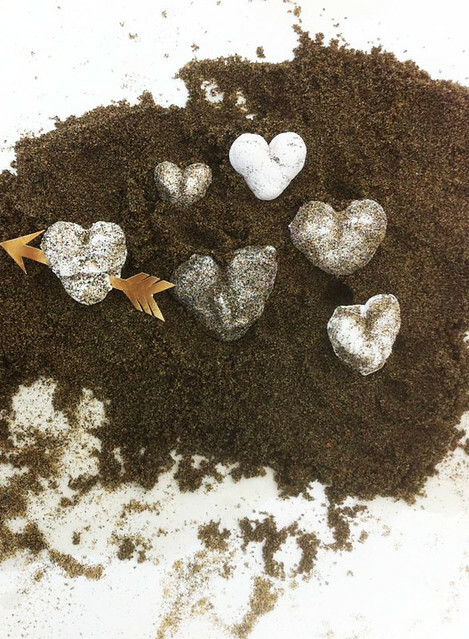 Find our more about our Collaborative Consumptive ways here. So Merry Christmas everyone and happy, healthy and prosperous New Year to you all! Those that have read 'Nige's Ramblings' webpage will already be aware that he has what some might say is a ridiculously optimistic view of the future for us all. His take on the future is mostly based on the idea that everyone should be lovely to each other and those that aren't lovely should be ignored until they get bored with being horrible and decide to be lovely too. Now to add to this Nige believes that artists and crafts people hold the key to a better way of life based on the fact that they are natural collaborators who are used to working in the understated realm of sharing, honesty & trust. A new economic model has arrived. Named by TIME as one of the “10 Ideas That Will Change the World”, 'Collaborative Consumption' describes the shift in consumer values from ownership over to access. Together, entire communities and cities around the world are using web based technologies to do more with much less, they do it by by renting, lending, swapping, bartering, gifting and sharing products on a scale never seen before. Collaborative Consumption is transforming business and consumerism and is impacting on our lifestyles right now. In short we're finding it's giving us a more fulfilling and sustainable quality of life. As some will know us lot at Eccleston George have a rather nice beachfront studio on the Isle of Wight, we call it 'The Works'. 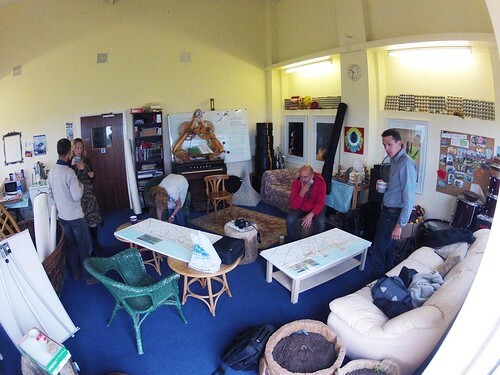 2014 will mark the beginning of our third year in our studio, a place we use for meetings, making things and sharing with an array of other artist and musicians. We're happy to let anyone use our studio for free and in this respect it's become an important space for quite a lot of people. The reason we can offer The Works to others for free is because it's free to us, or at least we don't pay any money for it, instead we barter for it, we make our skills available to our landlord for an agreed number of days. This arrangement illustrates perfectly one of the three ways Collaborative Consumption works. So for us at Eccleston George our working lives are about 'collaborative lifestyles', this is the first way collaborative consumption can work. Here people with similar needs or interests band together to share and exchange less-tangible assets such as time, space, skills, and money. These exchanges happen mostly on a local or community level, as people share working spaces like we do or perhaps gardens or parking spots. Collaborative lifestyle sharing happens on a global scale too through activities such as peer-to-peer lending (on platforms like Zopa and Lending Club) and the rapidly growing peer-to-peer travel (on Airbnb and Roomorama). Another way to consume collaboratively is with 'product service systems' that enable companies to offer goods as a service rather than sell them as products. Goods that are privately owned can be shared or rented peer-to-peer. This kind of business seems to appeal to the increasing number of people shifting to a usage mindset: In other words they want the benefits of a product, but they don’t need to own the product outright. With 'redistribution markets' used or preowned goods are moved from somewhere they are not needed to somewhere they're wanted. In some markets, the goods may be free, as on Freecycle. In others, the goods are swapped (as on thredUP and SwapTrees) or sold for cash (as on eBay). It has been said that soon, “redistribute” may become the fifth R—joining “reduce, reuse, recycle, and repair”—and a key form of sustainable business. Collaborative consumption isn't a niche trend, and it’s not a reactionary response to the recession either, it’s a socioeconomic groundswell that is transforming the way companies think about their own value and the way people fulfill their needs. Artists and craft workers have long known the benefits of working collectively and the three realms of collaboative consuming described above..... I think the creative process almost demands it from us artists at some point or other in our careers. Eccleston George is an example of how people can and do club together to do things that on their own they'd never attempt, I think that we display quite nicely how pooling your skills and resourses can get you stuff you want or need. In the fourteen years we've been operating from the Isle of Wight Eccleston George has morphed several times, members have come and gone but all have left their indelible imprint on our working methods and so have altered our group course for the better. In the decade and a bit that we've been around we've watched other collectives spring up around us and marveled at how they too seem to benefit from the 'safety in numbers' ethos. What's even more exciting is that we're now seeing businesses, charities and even corporate giants following in our footsteps and even more amazingly than that we've been asked to give some of them them advise and support now and then! So 'Collaborative Consumption' is here and if you want to find out how to join in then my advice would be to find an artist near you and watch and learn! 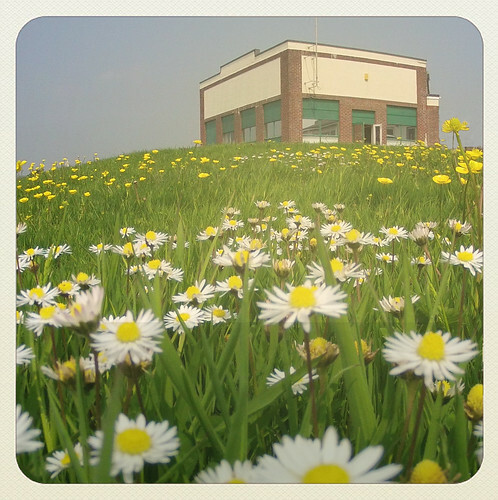 Our studio 'The Works' has gone from being an empty building collecting dust and rubbish to a place that creates opportunity and boosts the economy. 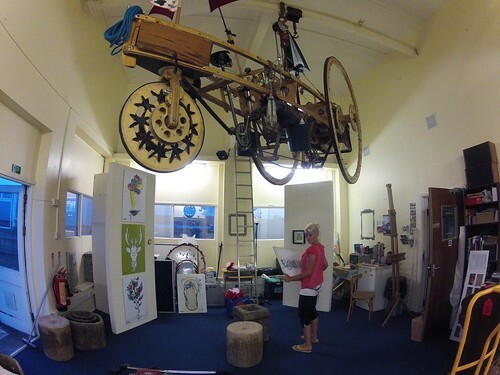 Provide events and exhibition space for artists. Provide free space for bands to rehearse. 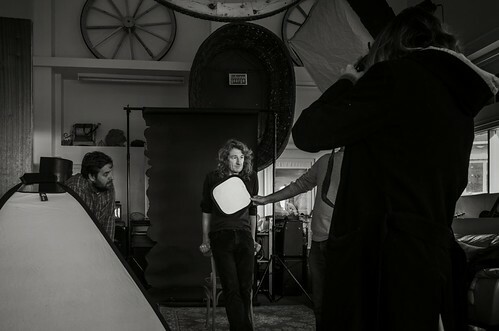 Share the space with other freelancers like this peer to peer photography skills swapping workshop. Play host to big named potential clients like Merlin Entertainments. These are just a few of the things happening at 'The Works' that have in various ways generated over £600,000 back in to the economy in two years. 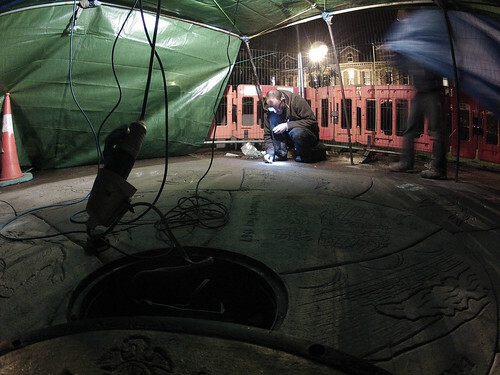 The Works receives no outside funding and we ask for nothing from local authorities or national goverment, Big Lottery or any other funding initiatives in order to run the building. 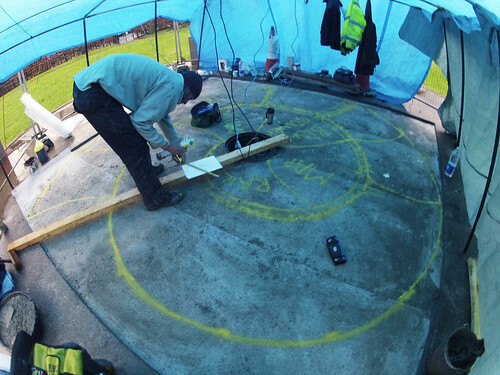 The Works is sustainable because of the arrangement we have made with our 'landlord' which is based around swapping our skills in return for the building space, no money changes hands, just time and skills. 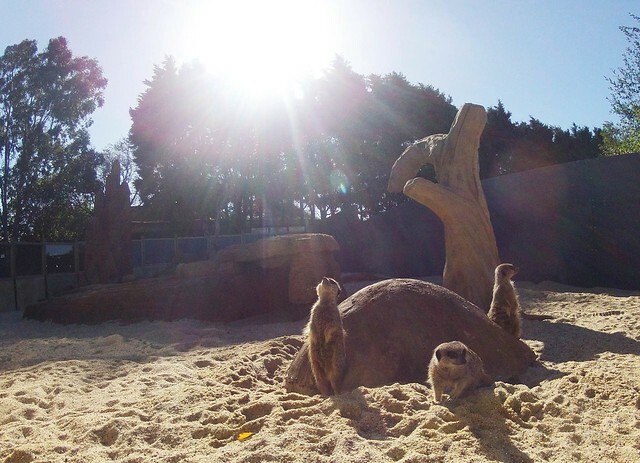 Meerkats move in to their new manor! 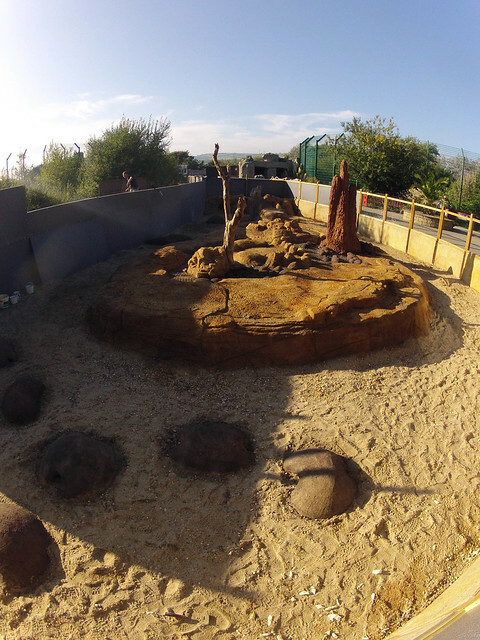 Twenty days in the making, with design and build input from the local primary school's staff and children as well as the zoo's own visitors and the day finally came to let the Meerkats of the Isle of Wight Zoo in to their brand new enclosure. This astonishing and totally unique zoo development project has proven to be a great success with everyone from the zoo's own staff to the local community and of course the Meerkats themselves. You can find out more details on our blog here . 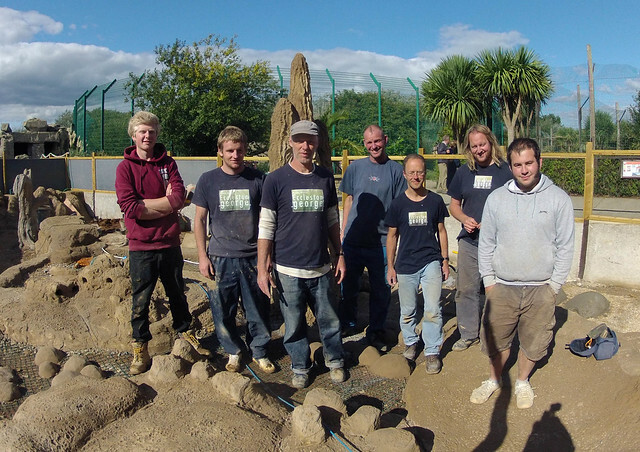 Our own Nigel George says - " Involving the local school, community and zoo visitors in the design and build of this enclosure means that lots of people have a real stake in the Isle of Wight Zoo, they'll be able to say 'I helped to make that' and that's quite something I think. As a result of working with children through the research and design phase this enclosure has a narrative that is now perceptible from the visitors viewpoint when they look at the enclosure. The whole scene represents a dry riverbed and there are clues and stories to be unravelled when you watch the meerkats using the landscape just as they would in the wild." 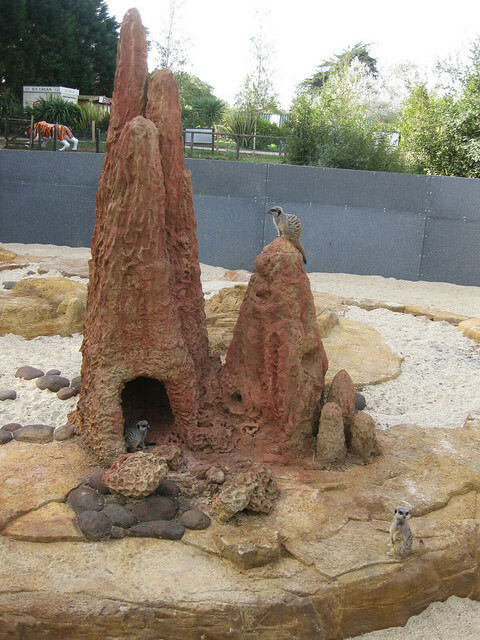 Here are some photo's of the Meerkats moving into their new home. The termite nest complete with destruction caused by an Aardvark or Pangolin.